“It’s crazy at work” – how many times have you heard yourself complaining about this? When did working throughout the nights and weekends become a badge of honor? Or hearing managers tell you that you’re like one big family, only to request something from you afterwards (such as ignoring time with your real family), because, hey, com’on, you cannot disappoint your family! Or found yourself dragged into all sorts of useless meetings and commitments you couldn’t say no to? Anxiety through the roof after realizing that important decisions were taken overnight by your team on chat groups and you didn’t get a chance to process the information and contribute with input? Always asking yourself where did your day go? Burned out already a few times and wondering when will it be enough? 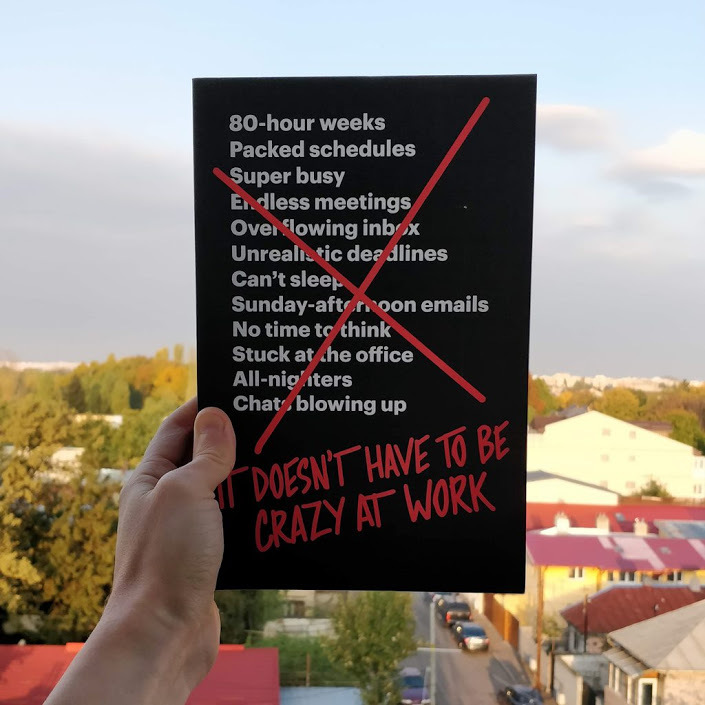 If all these sound painfully familiar, this is the book for you: “It Doesn’t Have to be Crazy at Work“, by Jason Fried and David Heinemeier Hansson, the two guys who founded the project management software Basecamp (formerly called 37signals). Fried and DHH talk about what they call “the calm company”: a different company culture, one that questions all the “best practices” in the modern work environment. They’ll force you to rethink all the aggressive hustle, long hours of work that became the norm, sleepless nights, shared work calendars, being permanently connected, and other “whatever it takes” tasks that seem required to run a successful business nowadays. They strongly believe that longer hours are not the answer, as it’s impossible to outwork everyone in the world. There’s always going to be someone, somewhere, willing to work harder. Instead, you need to learn how to work smarter and with less distractions. And they don’t talk about it from a theoretical point of view. They have skin in the game and are the living proof that it’s possible. They built and have been running a successful tech business for almost 20 years, without all the chaos, anxiety and stress. And this is the book where they show you exactly what they learned from their experience. Use it as a way to question all the habits you inherited or learned from your environment. It’s your toolbox for dealing with crazy and building better, healthier habits, that will make you increase your efficiency. The only problem I identified with this book? It will probably be read only by those people who are already leaning towards this mindset of a calm company, instead of those who need it most. The others will probably change only when the costs of not changing will be unbearable. If you already read their previous books, Getting Real, Rework and Remote, or if you’ve been following their blog posts, this book will reinforce some concepts you’re already familiar with. It could also be a great gift for the end of this year, when everyone’s drawing a line and taking time to set the new year’s intention.